I decided to list my essential make up items as well as my staple beauty products, as I believe they go hand in hand beautifying my everyday! MAC foundation, most of the times Selct FPS 15 in NC37 – I have tried many foundations in my life (trust me, I am a girl who had severe acne when younger), and this is the one I stuck with for quite sometime. Great to apply, it has a medium coverage. I am, at the moment, trying MAC’s Matchmaster, which has slightly better coverage than the Select and I am very happy with it too. 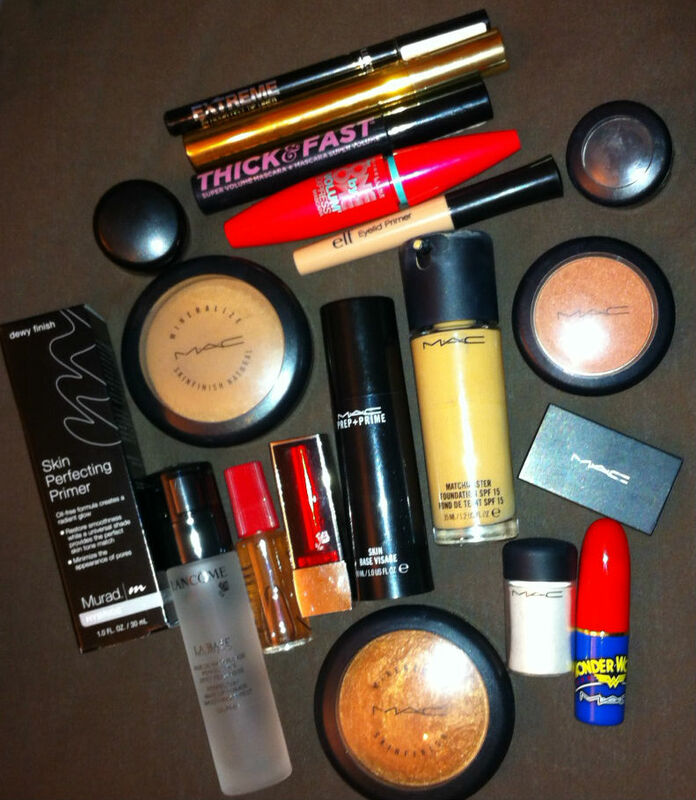 I sometimes mix my foundation with moisturiser for everyday use or build up for hard-wearing make up. MAC Mineralize skinfinish natural powder, in medium dark – cannot live without, usually brush on top of my foundation to add colour, but sometimes just on its own it offers you good coverage without being heavy, at all. MAC Sheertone Shimmer blush in Sunbasque – so versatile…. could, in desperate times, double up as a bronzer, it goes with most colours. When I am full make up on, I use it only on the apple of the cheeks, with Mineralize blush in Chic Couple under the cheek bone for extra definition. MAC Mineralize skinfinish bronzer in Gold deposit – not too overpowering in colour, gives you that lovely glow, suitable for the winter and summer, can be built up…. great for a bot of contouring. MAC eye shadow in Carbon – another super versatile item. An intense matte black, I wear it as for fierce smokey eyes or on a daily basis as eye liner. Mascara usually Maybelline Falsies, but lately been dabbling with YSL – you can check the review here, Soap & Glory and Maybelline One by One. Eye liner – I have and use many different ones. The one I am quite into at the moment is the The Collection 200o Extreme 24 hour felt tip liner in black. I use eye shadow as eyeliner, gel liners from Maybelline and MAC. MAC brow shader duo – a nice little matchbox like packaging with a dark shadow for your eyebrow and a lighter for the brow bone. It has been discontinued, I am lucky I have two and they last forever! MAC pigment in Vanilla – so great, really gives your brow bone that extra, glamourous sheen, lifting your brows up to the sky! Amazing buy, a little pot will last you a long time. Eye shadow – I own a plethora of shades… cannot get enough of eye shadow, could not pick a favourite, as it varies with my mood. Lancôme Color Fever lipstick in Hot Stuff Rouge: a metallic red I think this colour has been discontinued, which is shame, as it is the best red ever! It is not too bright so suitable for day wear, it has a smooth creamy texture, so it glides when you apply – it is so good, I don’t even have to use a lip liner. I love it! MAC Russian Red lipstick – hot. That’s all. Lipcote lipstick fixer – I swear by this product. After reading reviews that it dries your lips more than fixes the colour, I was a bit unsure about buying it. My lips are quite dry, and this product hasn’t made it any worse. It fixes the colour beautifully, and I never wear a red on a night out without applying this on top. It stays put most of the night and it won’t stain glasses when you drink. Great! A primer. Been using MAC’s Prep+Prime Skin for a few years and recently discovered Murad Hybrids Skin Perfecting primer (dewy finish) which did wonders for my skin – a brilliant primer for acne scarred skin. I also use Lancôme’s La Base Pro. Eyelid primer – at the moment using e.l.f and happy with it. Face moisturiser – Nivea visage Oil free moisturising fluid is great value for money. I also wear Clinique’s Dramatically Different Moisturizing Lotion, but this Nivea one is a great budget alternative – the texture is pretty much the same, it absorbs quickly, it moisturises well and my skin likes it. Victoria’s Secret hydrating body lotion in Pure Seduction – been wearing it for a good 10 years now and it is the only moisturiser my body has seen. Love the consistency, the hydration and the smell is to die for. Sadly, not largely available in the UK (soon to be though), so I stock up from duty free, and suffer the occasional “moisturiser depletion anxiety” when I think I will run out before another trip abroad. Victoria’s Secret ultra-moisturizing hand and body cream, also in Pure Seduction- just like above, but I use it as a hand moisturiser. It is just great, more supple than the body lotion, also good for elbows and knees. St. Tropez Everyday Airbrush fake tan – easy to apply, never had streaks, the tan looks natural – worth noting I do not abuse it!The smell could be better, but could also be much worse, so overall, I like it and rely on it. Lip balm – my lips are quite dry, and I suffer a lot in the winter; you won’t see without Vaseline lip therapy cocoa butter and lately créme bruleé or cherry Carmex. Clarins Cleansing milk and Toning lotion for combination/oily skin – I know I should wear it twice daily, but I usually do it once, before going to bed. The toning lotion is also a good astringent, and I wear it on my eye lids as part of my eye make up prep! Clinique 3 step system – I usually do this in the mornings. At the moment, I am using the soap bar and clarifying lotion 2, for dry combination skin. Batiste dry shampoo – an absolute saviour. When younger, I used to wash my hair every day, because it is quite fine and looks dirty in 24 hours. Not anymore, dry shampoo (and ballerina buns) changed my life. L’Oréal Absolute eye & lip make-up remover – another saviour, been wearing for a long time, cheap and cheerful, does the job brillianty. Kérastase Nutritive Nutri-termique hair mask – this is a miracle worker, using it once a week for about a year really changed my hair’s condition. Really amazing product. Kérastase Lait Nutri-sculpt leave in smoothing hair foundation – in combination with the hair mask, this also changed my hair – it enabled me to grow it with the best condition my hair has ever been. 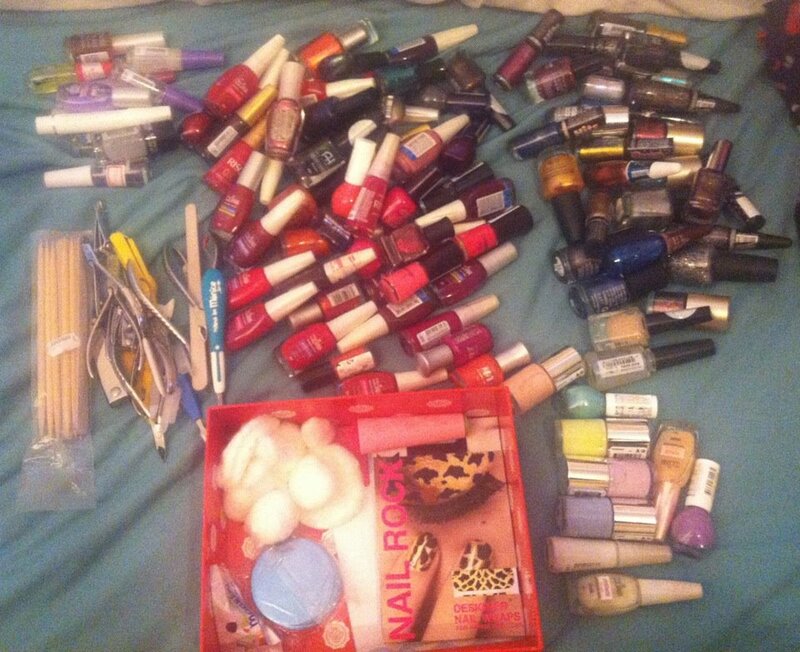 Nail varnish – lots and lots of it, in a rainbow-like palette!!! What about you? What are the products you cannot live without? Have you tried any of my favourites? What did you think?